Answer: Very carefully. I had a pair of those mylar “eclipse glasses” with cheap cardboard frames for casual viewing of both events. They’re designed to allow safe observation of the Sun, but I don’t trust them nearly as much as #4 welders goggles. Even a pinhole or scratch in the mylar could let enough unfiltered sunlight into your eyes to cause permanent damage to your vision. 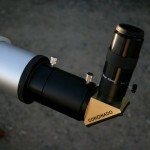 Both the eclipse and Venus transit (above) looked better through a telescope anyway. 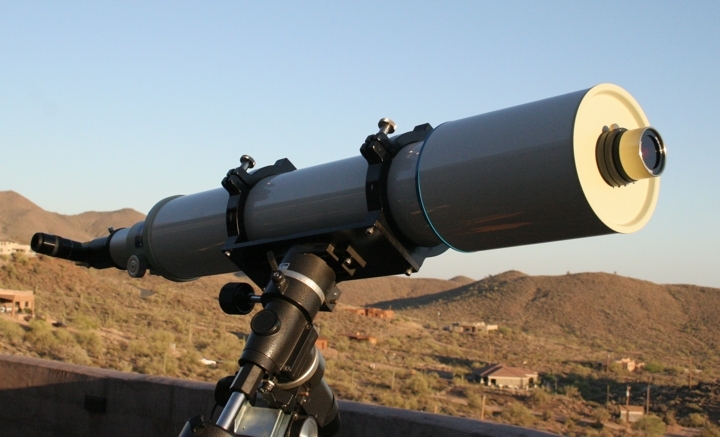 Of course, you can’t put goggles on a telescope, so a special filter is required. There are many types available. 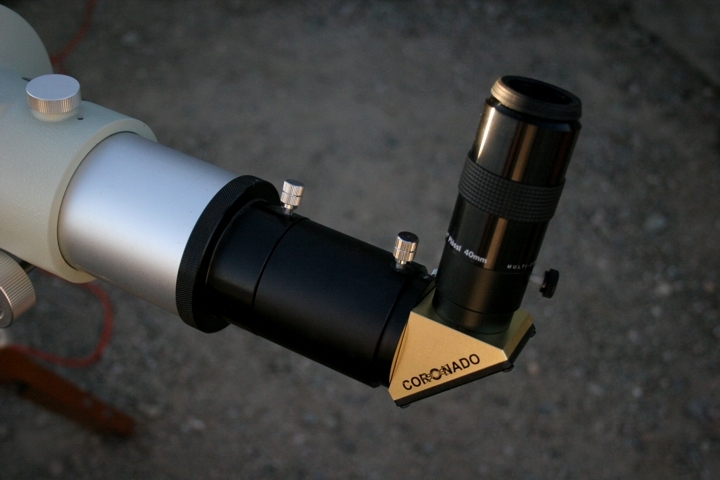 My choice is what’s called an H-α (hydrogen alpha) filter, manufactured by Coronado Instruments. Set me back close to $1000, but it’s a two part system that I totally trust to be safe. One part goes on the front of the telescope (left thumbnail) and the other attaches at the back where you actually put your eye (right thumbnail). Click to enlarge. One of the reasons it’s such a safe system is that it only allows light with a wavelength of 656.28 nm (nanometers) to pass through to your eye. That’s the wavelength emitted by hydrogen atoms (which make up a large part of the Sun). It’s also why the Sun looks red rather than its usual yellow-white color in my photograph. 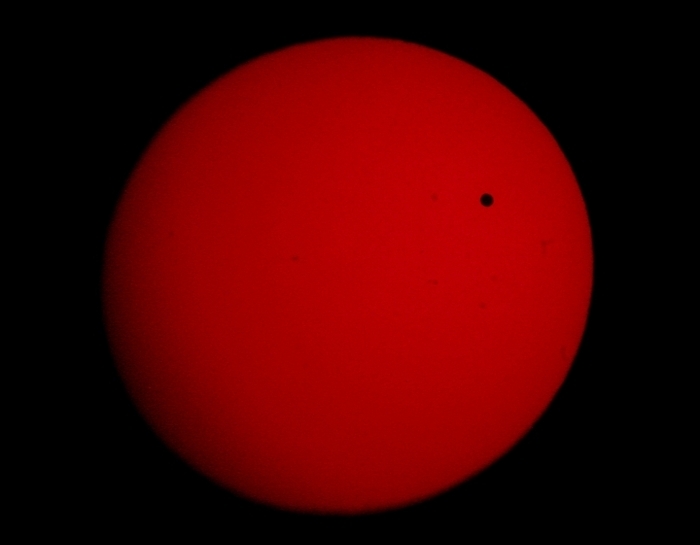 You can see the black dot of Venus silhouetted against the Sun at about mid-transit. It passed over the Sun’s surface, entering around the 1 o’clock position and leaving around the 5 o’clock position. You can also see some small groups of sunspots. These magnetic disturbances are somewhat cooler than the rest of the Sun, and appear black by comparison (even though they are still thousands of degrees hot). At higher magnifications you can also see solar prominences (flares) along the edge of the Sun. 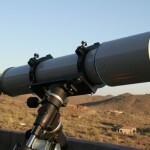 Check out this image I obtained back in 2006, and posted on our astronomy club website here. I took many photos as Venus passed in front of the Sun, and I’m now in the process of assembling them into a time-lapse video, as I did with the eclipse last month. I’ll have it for next week’s Sky Lights. Tune in then to see my results.